Although he was born two years earlier than the late Sen. Robert Byrd, to many West Virginians, it made sense that Ken Hechler ’35 would challenge Gov. Joe Manchin in the Democratic primary to replace Byrd. An independent streak in politics and passionate dislike for strip mining have been defining features of Hechler’s seemingly endless political career and he saw the chance to allow voters a referendum on mountaintop removal. 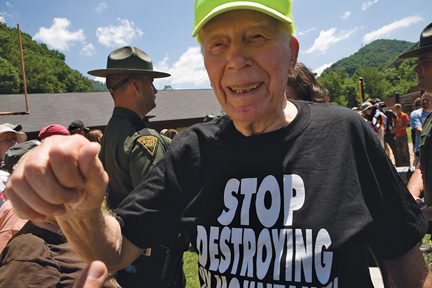 Just as he had been the lone member of Congress to march for civil rights at Selma, Ala., when it comes to mountaintop removal, Hechler, now 95, has put his money where his mouth is. Last year, Hechler joined a Climate Ground Zero protest and crossed onto Massey Energy property, but the police refused to arrest him. A month later at another CGZ action, he succeeded in being one of 32 people taken into custody. No one has a better claim on the anti-mountaintop removal banner than Hechler. He held the first congressional hearings on the practice in 1971 and then introduced the first federal bill to abolish strip mining. He got 90 co-sponsors—none from West Virginia—but the bill was bottled up in committee. He tried in vain again in 1974. When Congress finally passed legislation controlling surface mining in 1977, the regulations were watered down and mountaintop removal was exempted. So Hechler voted against the bill. Hechler ran against Manchin on a single issue. “A vote for Ken Hechler,” he repeated across the state during his five-week campaign, “is a vote against mountaintop removal.” Environmental activists rallied to him and in a three-way race, he came in second with 17.3 percent of the ballots—enough, some say, to embarrass Manchin, who captured 72.9 percent. 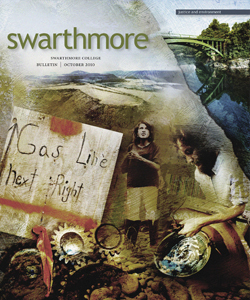 Learn more about the Dennis Farm and natural gas drilling in the Marcellus Shale at the site created by students in the 2010 capstone seminar of the Environmental Studies Program.